Atheists are brutal and genocidal. I saw a meme (a photo with captions) in a Facebook page about comparison between religious people and the atheists. 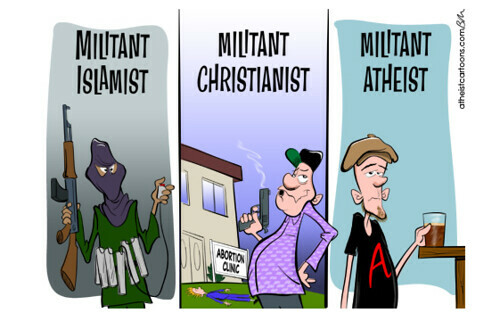 Atheists poke fun at people with religion both Christians and Muslims for the bloodshed that the two big religions have committed. The cartoon below is similar to it, but I could not find the exact photo. Sorry to disappoint you atheists, but you too are bloody and murderous. Kim Jung Un is atheist. He ordered the death of his uncle, and according to news sources, he was fed to the dogs. Thirty three North Korean Christians are facing execution, it’s just a matter of time. Hitler was also an atheist, yes he grew up a Christian, but he converted to atheism, and later probably because of delusions of grandeur set himself as God. The latter description is based on a “worship” song sang by German school children in the later part of World War 2. China is also an atheist country, we all heard about brutalities done to its citizens. Communist USSR, though commonly called Russia back then was an atheist country. A lot of horror stories, its citizens escaping out of the country. Atheist countries are similarly authoritarian and abusive like the Islamic countries. Russia’s present president Putin has labeled himself and his country as Christian. He probably learned something hard from their past atheistic history. Lastly, Timothy McVeigh, the man who bombed a Oklahoma City building in the United States on April 19, 1995 resulting to the death of 168 people, including 19 children, with several hundred more injured. He was an atheist too. So atheists, don’t be “self-righteous” as well :). Previous Post:Which should be banned in Malls and Banks?